TUS Lemförde Table Tennis Team Acquires New Kit! The old team kit was looking quite tired after its many years of wear and frequent washing. OMEGA Technology Plastic GmbH & Co. KG Diepholz is now acting as the team’s sponsor and is sponsoring the new kit. The logo is printed discreetly on the shirts and demonstrates to match spectators from the areas around Brockum, Lemförde and Lembruch that Omega is a local company that is keen to get involved with community sporting activities. Reinhold Angermüller as the section leader and Marco Cloppenburg as team captain of the men’s first team shown thanking representatives from OMEGA Jürgen Exner and Joel Olbert for their support as they present the new sports kit. 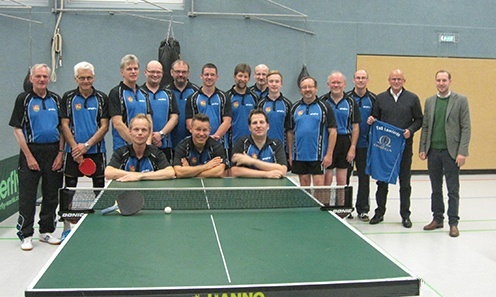 It is interesting to know that the table tennis club at TUS Lemförde includes 3 teams of 40 players ranging in age from 7 to 78 years.